Well, there are so many celebrations today! Good Friday, Earth Day...and then Easter this Sunday! Do you have any big plans? We are throwing my grandma a birthday party tomorrow, then Easter dinner on Sunday, so ours is shaping up to be pretty great. Until then, here are some great DIY projects for you to tackle in your spare time, or for last-minute Easter decs. Hope you enjoy! 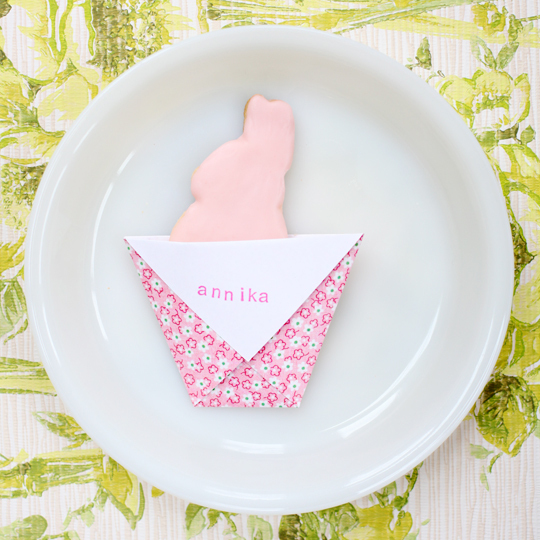 Lovin' these easy and adorable Easter place cards, spotted via Poppytalk and created by Janis of Pinecone Camp. That bunny cookie looks quite at home! 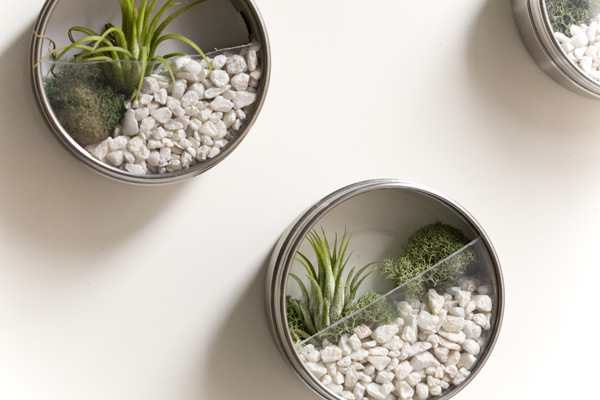 These wall terrariums via Ruffled, while indeed perfect for wedding favors, would also be a great project for your home, especially with magnetic paint widely available, or those modern magnetic strips for the office. This bee-yu-ti-ful ruffled shower curtain was created by Taylor Made and inspired by the ones you see at Anthropologie. I absolutely want to make one for our upstairs bathroom in different shades of light blue, and now I know how! 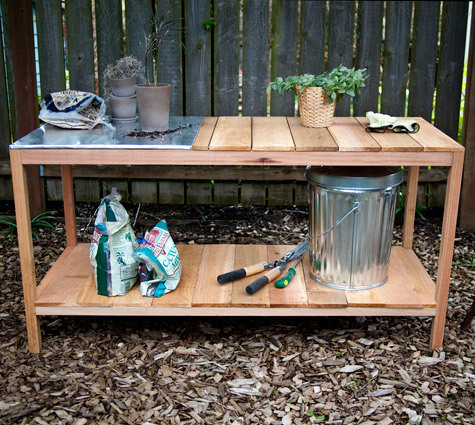 For those of us wanting to brush up on our woodworking skills, this planter table is super simple (especially if you have the wood pre-cut) but oh-so practical. It was made by Matt and spotted on Design Sponge. 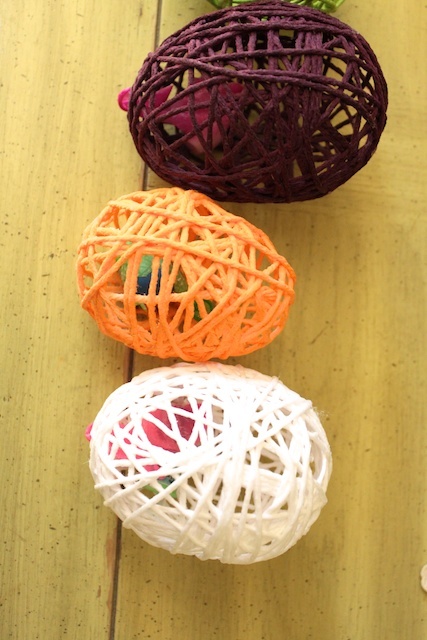 Can you imagine making a ton of these little guys in all different colors and floating them across your Easter table? Well, clearly I can. 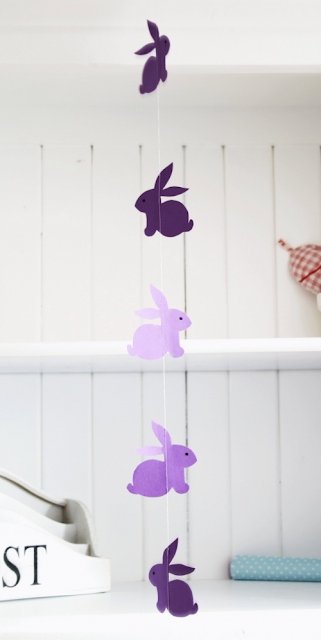 I love this little garland project, spotted at Twig and Thistle and created by Titatoni. The texture of this yarn eggs really draws me in. They'd look great grouped together in bowl, or use this technique for another shape to make year-round decs for your home! These were created by Simply Modern Mom. 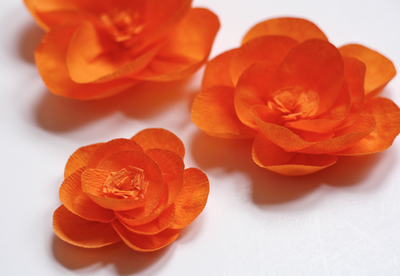 Lastly, I love these crepe paper flowers by Jessica over at How About Orange. She's very talented at manipulating all kinds of paper, and certainly live up to her reputation here, especially the detailed center of the flowers. Love.